A bouquet of berry-toned blossoms is arranged in a plum glass cube in this chic floral arrangement that will catch someones fancy. Send one today to a tried-and-true friend, and theyll feel wonderfully fashionable. 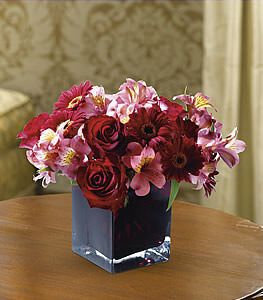 Pink bi-color roses, pink alstroemeria and red miniature gerberas arrive in a plum cube. Note: not available in all areas; a clear cube may be substituted if the plum cube is unavailable.